Hey. Just learned about a cool data structure for computational geometry called, KD-Trees. Yes, it's sort of embarrassing that I've just now learned about them, but what can I say? I still think they are cool. Anyway, KD-Trees are like binary trees but for points in space. They make it really easy (well, fast) to do things like search for the nearest point in a set to some given point. 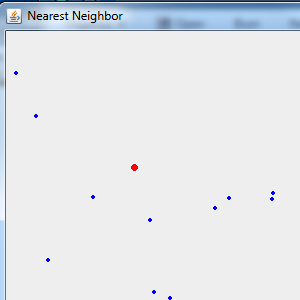 SO, I quickly hacked up a nearest neighbor application. It generates a bunch of random points, and then when you click highlights the nearest point in red. Yay. Click here to download the JAR if you want to run it. It's on of those runnable Jars... remember those? Ah, Java... I tried to make it an Applet, but that process was even more ridiculous.